The past week has been the most amazing 7 days we've had in the last 6 months. That may sound dramatic but it's true. Yes it was exciting to finally receive Finn's heart after 73 days of waiting, but the struggles that immediately followed were filled with fear and grief. That darkness didn't let up for a long time. Until last Thursday actually. Finn's problems persisted after his last run in with rejection. The hemorrhage in his lungs didn't seem to want to let up and there wasn't much the team could do. Admittedly I started to get angry and I convinced myself that everyone was giving up on him. In fact, they were actually letting his body heal and man did he take his sweet time. Being in this world for so long now I am used to taking action and it was difficult for me to sit back and watch us do nothing. My over analytical and high anxiety brain believed that we had dropped to the bottom of the totem pole and the team was busy working on the more high profile cases. Our nurses were turning over and the visits from service seemed a lot less frequent. I realize now that I was perhaps being a little paranoid, but what mother wouldn't fear that bleeding lungs could be the final tipping point? When Finn's bleeding finally did let up we still struggled to wean his vent. Talks of more long term ventilation strategies started and before we knew it we were sitting in a conference with ENT and pulmonology discussing the advantages of a tracheostomy. Pros and cons were weighed and we had conversations about next steps. After a tear filled meeting I knew I had to be sure that we were doing everything we could for him before taking such a big leap. The next morning I called the Children's Hospital of Philadelphia (CHOP) to get a second opinion. 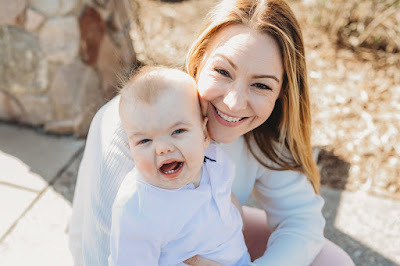 Ever since Finn's transplant we have been throwing around the possibility of a lymphatic system issue contributing to his difficulties. It's rare and CHOP specializes in diagnosing and treating these type of issues. I had to know what they thought. We waited for nearly two weeks to hear back from them. In that time Finn decided that a trach wasn't for him. 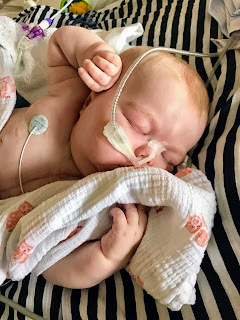 We slowly weaned the vent and then at 8:08 AM on Thursday September 14th Finn was extubated to a high flow nasal cannula. By the time we heard back from CHOP Finn was sitting on 25% FIO2 and a flow of 6 liters per minute. We've continued to see him wean his Precedex and become as much of a normal baby as one can be living in the ICU. 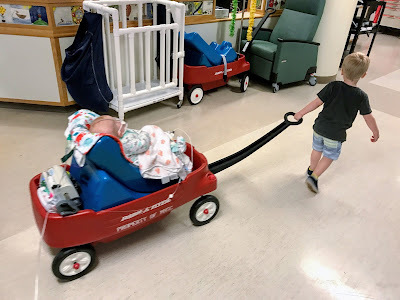 Each day he has been going on wagon rides around the floor, sitting up, rocking, playing, being held and so much more. CHOP was satisfied with our approach so far and told us that we should plan on long term diuretics and a low fat/fat free diet. He will be able to have breast milk eventually but it will need to be spun and skimmed. If he doesn't show progress we will talk more, but for the moment he seems to be in a stable spot. It almost feels surreal that things are okay. We've spent most of this year in fear and grief. Can this joy be real? Will it last? I sure hope so. Each day I try not to worry that we will revert back to the dark and scary stuff and just live in the moment. I am grateful for every smile and wagon ride. It's hard when we have had good days in the past that were immediately contradicted by bad ones. How do you retrain your brain to not be constantly waiting for the shoe to drop? For now, we will take as many wagon rides around the unit that we can. We will snuggle, sit up and play, smile and hope that we can maintain this wonderful progress. Perhaps we've finally turned the corner for real?